True believers in Jesus Christ get their theology from HIS WORD only. C.S. 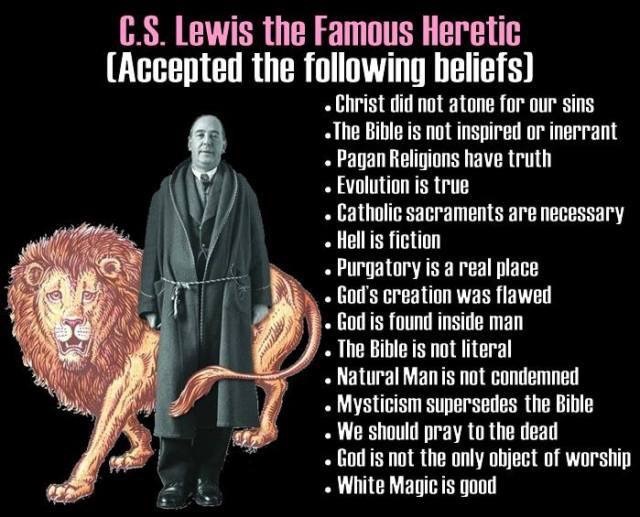 Lewis was clearly a heretic. No mere man has any divine authority as did those “holy men of God” who were “moved by the Holy Ghost” to write the Holy Scriptures (2 Peter 1:20-21). Not only was C.S. Lewis a fraud and wolf, so is every modern beguiler who promotes him or any other deceiver associated with him. Any “pastor” who attempts to use C.S. Lewis quotes, books, or movies to show spiritual truth is a wolf. God gave us the knowledge of Him via His written Word in the 66 glorious books therein. So many truthless, crossless beguilers today do not look to the written Word and final divine authority for all matters of faith in God. They never cease searching for and welcoming the next Godless entertainment/movie to promote and try to convince others that it’s all good and of God. Jesus told us that all “idolaters” will be judged eternally in the lake of fire (Revelation 21:8). False teachers will all be in hell and Lewis is never on record as repenting 2 Peter 2:1-3 – “their DAMNATION slumbereth not.” All who endorse wolves like this and others will suffer the same fate and future for promoting Christ’s very enemies (2 Chronicles 19:2; 2 John 1:7-11). TELLING: J.K. Rowling (author of the demonic Harry Potter series) has said that C.S. Lewis is one of her two favorite authors (the other being Jane Austen). It should come as NO surprise to Christ-honoring Christians that C.S. Lewis was an unbelieving heretic. SOURCE: Christianity Today, C.S. Lewis Superstar, by Bob Smietana (December 2005, Vol. 49, No. 12, Page 28). How salvation (the general scope) works: “There are people in other religions who are being led by God’s secret influence to concentrate on those parts of their religion which are in agreement with Christianity, and who thus belong to Christ without knowing it … For example a Buddhist of good will may be led to concentrate more and more on the Buddhist teaching about mercy and to leave in the background (though he might still say he believed) the Buddhist teaching on certain points. Many of the good Pagans long before Christ’s birth may have been in this position” (MC, pp. 176-177). God “often makes prizes of humans who have given their lives for causes He thinks bad on the monstrously sophistical ground that the humans thought them good and were following the best they knew” (SL, p.26). “There are three things that spread the Christ-life to us: baptism, belief, and that mysterious action which different Christians call by different names — Holy Communion, the Mass, the Lord’s Supper” (MC, pp.62,63). In the other world “there will be every occasion for being the sort of people that we can become only as the result of doing such acts here” (MC, p.63). C.S. Lewis is perhaps the biggest FRAUD in Christianity today and accepted by many Christians. His works and words are sadly promoted by truthless, shameless, self-serving wolves. From his own words we discover that C.S. Lewis was a brazen heretic and must be shunned by every Christ-loving Christian. Lewis’ books are mostly aimed at children, and he uses demonic devices to lead them into the dangerous realm of the occult. These claims can easily be found by researching many sources, some of which we have listed below. “How is that for honoring God? It’s no wonder there are many professing Christians who think that paganism could be used to advance Christ, because that very meaning is conveyed in Lewis’ works! This claim can be refuted by John 14:6 and Acts 4:12 and is blasphemy to God. This is the satanic ecumenism spirit trying to bind Christianity with all the religions of the world. “The idea that hell is not a literal place is promoted in the modern version NIV (everyone who has tried to convince me that hell does not exist goes for a modern version to defend this false idea). Lewis is wrong and his own words condemn him (Luke 16:23). In sharp contrast to this blasphemy, read John 3:16-17, Romans 5:8-10, 1 John 4:19. Lewis will be answerable to God for his evil influence on these generations. It is every Christian’s duty to contend for the faith and to expose works of darkness. I pray that churches who use his material would wake up to this false teacher. “Lewis says sincere unbelievers may go to Heaven … Some heathen may belong to God without knowing it. There are people in other religions who are being led by God’s secret influence to concentrate on those parts of their religion which are in agreement with Christianity, and who thus belong to Christ without knowing it. For example a Buddhist of good will may be led to concentrate more and more on the Buddhist teaching about mercy and to leave in the background (though he might still say he believed) the Buddhist teaching on certain points. Many of the good Pagans long before Christ’s birth may have been in this position.” (p.176, 177). “Worthiness of heaven is based on “the beginnings” of inner “qualities,” not salvation. In 1931, after being an atheist since age 15, Lewis claimed to have been converted to Christianity. So Lewis was a “christian” at age 15, these quotes were AFTER that supposed experience… It is clear from Lewis’ own words that he was not a born-again Christian. Lewis plainly taught that water baptism and sacraments were a means to finding, what he termed as, the “Christ-life” (Mere Christianity, pp.62,63). New Agers and ecumenical compromisers love C.S. Lewis, because his philosophies attempt to yoke Christian beliefs with pagan religion. “I have therefore no difficulty accepting, say, the view of those scholars who tell us that the account of Creation in Genesis is derived from earlier Semitic stories which were Pagan and mythical.” (Reflections On The Psalms, p.110). The author of The Chronicles of Narnia, Clive Staples Lewis, was a professor at Oxford University in England where he was supposedly converted to “Christianity” by another Oxford professor named J.R.R. Tolkien. Tolkien and Lewis would often sit together at a local pub or tavern and converse about their beliefs in the creatures and the activities of the middle earth, a strange realm of little people and magical powers. Tolkien often referred to Lewis as a “reluctant Christian.” Tolkien, though, was a Roman Catholic in doctrine and found his religion to be perfectly compatible with magic and the world of hobbits and elves. The story of the Narnian Chronicle known as The Lion, the Witch, and the Wardrobe is one of clandestine occult mysticism and is not Sunday School material unless your Sunday School is a de facto witch coven. The story involves a child from the normal everyday or mundane world. This girl, Lucy, who hides in a wardrobe as she is playing a game, suddenly finds herself transported to another world very unlike her own. It is a world of intelligent, talking animals and strange creatures. The little girl soon finds herself having tea with a faun. In witchcraft and ancient Roman pagan mythology, a faun is any of a group of rural deities, which have the bodies of men and the horns, ears, tails, and legs of a goat. The Roman god Faunus was also the god of nature and fertility and was connected to sexual lust. Here let it be noted that in the Narnian Chronicle Prince Caspian, this same strange land the little girl finds herself in is also populated by gods and goddesses; such as Bacchus, the god of drunken orgies, and the Maenads, who were frenzied women driven to madness in the orgiastic cult of Bacchus. In closing this urgent message, I pray that our true and dear Lord Jesus Christ will have mercy on the deceived and sleeping remnant, and that they will come fully awake and rise up against this subtle attack of Satan. The apostle Paul warned us in II Corinthians 11:14-15 as follows: “And no marvel; for Satan himself is transformed into an angel of light. Therefore it is no great thing if his ministers also be transformed as the ministers of righteousness; whose end shall be according to their works.” May God help us all, and may he especially protect our children from witchcraft in the churches is my prayer.